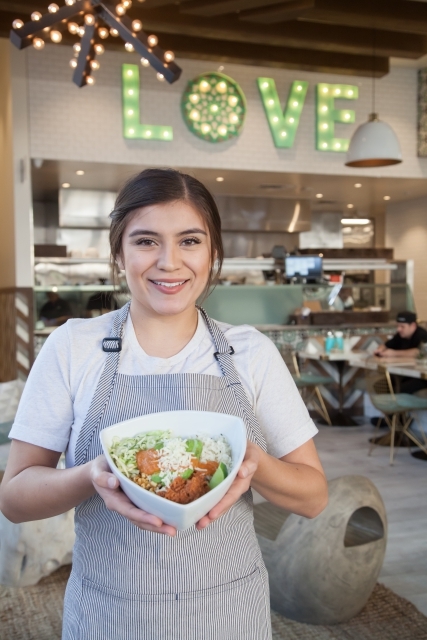 Server Brenda Zaragoza with the Street Corn en Fuego bowl : corn, jalapenos, cabbage, cilantro lime rice, avocado, arbol salsa, and queso manchego. Photo by JP Cordero/Civic Couch. Mexican food has been redefined in California at least twice in the last century. In the 1950s drive-in owner named Glenn Bell started experimenting with hard shell tacos, which were then a novelty, and stuffing them with hamburger fillings, including lettuce and cheddar cheese along with a salsa that had barely perceptible heat. The company Glenn founded, Taco Bell, reinterpreted Mexican ideas for the palate of Americans in the 1950s. Fast forward to now. We still like crisp tortillas with meats, cheese, and vegetables, but we prefer healthier versions, and our tolerance for heat has increased exponentially. Entrepreneurs and chefs have been ready, willing, and able to create Mexican-inflected meals for moderns, abandoning authenticity to harmonize with 21st century aesthetics. 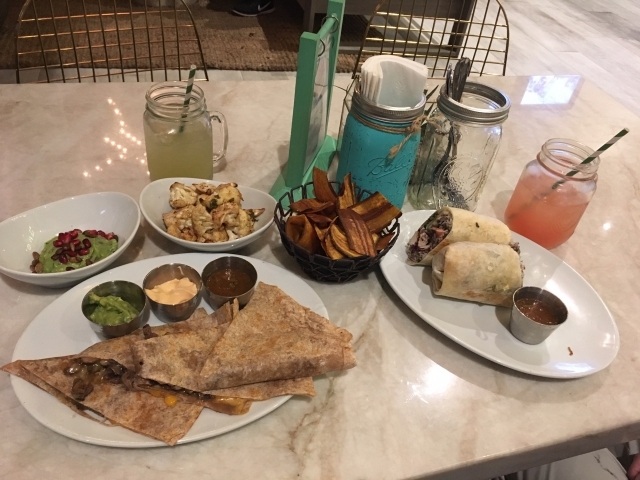 The latest contender in the race to please palates is Tocaya Organica, which began in Venice in 2016 as a spinoff of an upscale Mexican place in Downtown LA. They’ve gone from one location to eight in only two year. The newest one is at The Point, at the corner of Rosecrans and Pacific Coast Highway.. While it may be Mexican food in a quick serve format, it’s no Taco Bell. It’s upscale from the wood-look floor to the folk pattern tiles that go to the open ceiling.One area is set like a living room with trendy carved chairs across from a comfy sofa with contrasting pillows. It looks like a lounge at which you might sit back with a glass of wine before your appetizer, and it comes as a surprise that they don’t serve alcohol. What they do serve is Mexican food for modern sensibilities: bright flavors with lots of vegetarian and vegan options. There is no pork, but among the protein choices you can get beef either asada or ground, turkey picante, chicken in either tinga style or achiote, sea bass, or a vegan picadillo. The rest of the menu goes on in this vein of multiple choices for everything, and you may be glad that there’s almost always a line because it gives you time to figure out what you want. Your meal will probably come with chips, either crispy banana chips or conventional tortilla chips. They have both on hand, but which your server will bring seems to depend on chance. My advice is to ask for both, so you get the dependable snack along with the edgy one. The banana chip is great with the medium-spicy salsa, less so with guacamole, and only partly because the fragile chips break when confronted with the thick avocado paste. That guac is worth getting a side of. It’s topped with pomegranate seeds and pepitas so you get some extra texture and bursts of flavor. The shaved brussels sprouts with a dash of lime and cotija cheese are another app worth having. If you pair that with the street corn or roasted cauliflower you have a nice little vegan meal before you even get to the main items. The corn is removed from the cob but is otherwise fairly standard, but the cauliflower with curry, garlic, and cumin tastes like a Mexican-Indian fusion dish. As a friend from South India noted, a Oaxacan mole sauce and an Indian curry are both spicy stews using a melange of aromatic herbs, so combining the ideas changed the details but not the concept. Though the other innovative dishes worked well, I wasn’t as much of a fan of the sweet potato bravas because though they may be better for you than the regular variety, it often has a gummy texture when fried. The mix of yam with three kinds of peppers has a nice complex kick, but this still wasn’t something I’d order again. Tocaya Organica follows the modern mix and match practice of offering proteins as bowls, salads, tacos, burritos, and quesadillas. There are subvarieties of each of these, so you do have some deciding to do while ordering. In the taco category alone you can decide between a fairly standard street taco or those assembled with onion, avocado, and vinaigrette, cabbage, chipotle, and cilantro, or pineapple salsa with chile arbol. That last item was a surprise hit for me because I’m not usually a fan of pineapple salsa, but in this case the tart citrus and heat were very well balanced. The burritos are a huge handful, no matter which one you try and I haven’t found one yet that I didn’t like, but I wasn’t a fan of the quesadillas. The Mexican cheese blend they use is heavy on the cheddar, and along with the sauteed mushrooms made this very oily. I’m usually a fan of quesadillas and tried this twice, but both times it was the least appetizing of the protein delivery systems. What I actually enjoyed most was their tostada with the recommended turkey picante and queso fresco. It arrives as a tall mound of salad, meat, and cheese precariously balanced on a standard corn tortilla. The addition of corn salsa to the standard lettuce and beans is a great idea and enhances everything else in the dish, particularly the spicy but not volcanic turkey. It’s validation, if any were needed, that this healthy Mexican food can deliver zesty flavors. They offer an array of hot and iced teas, coffees, and juice blends. You probably won’t miss the booze and certainly won’t mind not having a standard fizzy soda once you try some of these. I happen to like cucumber mint limeade, but enjoyed sampling others. The experience at Tocaya Organica is well above that at most Mexican quick serve places, but so is the bill. Figure on spending about twenty-five bucks per person and you’ll be in the ballpark. It’s worth it for an experience that is more than one cut above the average.